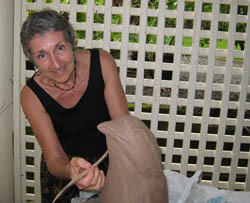 Artists Retreats in the Australian Tropics Develop Creativity. Your Group's Artists Retreats - Suggested Activities. This outline is a guide only but is a good indication of the type of activity and experience which is available to small groups at these retreats. Other activities, such as a visit to Cairns Regional Gallery, could be substituted for one of the days' suggestions. This is a guide only and all activities may not be available. Saturday – experience starts at midday with collection from Port Douglas B&B, a swim and simple buffet lunch at Cahaya Puri Guest Lodge. Bus tour of Port Douglas, including stop at Four Mile Beach, past Marina and up to stop at Lookout. Visit to Jill Booth’s or other artist's studio. Evening free (Info and suggestions supplied re restaurants, takeaways, taxis, buses etc). 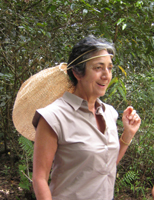 Sunday – markets, visit to Frieda van Aller's house for haiku writing tutorial. Visit to Linda Jackson’s studio. Sandwich/lunch DIY at accommodation (ingredients supplied). Afternoon free. Jill Booth available for tutoring assistance at Cahaya Puri’s studio. Beach barbeque. Monday – Whyanbeel Valley – Hoglunds Art Glass, High Falls Farm lunch, Gail Shaw studio (fruit tasting), possibly winery on way back or else just detour through Shannonvale. Dinner at Combined Club. 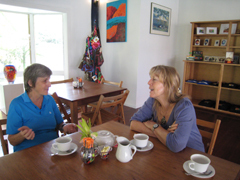 Tuesday – Optional 6am morning walk, short meditation and breakfast at Four Mile B&B. Low Isles - snorkelling, photography, sketching, history walk. Dinner at Salsa Restaurant across from the old sugar wharf and Saint Mary's church, a favourite venue for weddings. Wednesday – arrivals and departures, if any. Seven-day artists retreats guests spend morning making own art, could attend a Douglas Base class or tuition with Jill or other artist OR assemble at Frieda’s for tea/coffee and haiku session. Mossman Gorge walk and early lunch picnic then coffee at Silky Oaks and bus tour of Port Douglas for new arrivals before return to accommodation. Evening free. 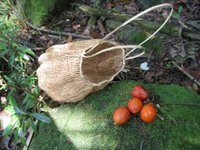 Thursday – visit Anna Curtis’ printmaking studio at Mowbray or Ellen Terrell’s pottery studio at Barratt's Creek near Daintree, then Daintree Village followed by a river cruise and lunch at the Daintree Tea House. Afternoon free to explore or photograph or develop own artwork. Dinner at Thai, Japanese, Greek or Italian restaurant in Port Douglas. 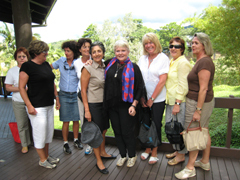 Here a happy group of friends enjoy a stroll around the grounds of Karnak Theatre with owner, actor Diane Cilento. Diane's death in late September 2011 has been a great loss to the Arts community and Karnak is currently unavailable to casual visitors. A short distance away, a backdrop of the mountains and High Falls in the distance, lives Gail Shaw and her partner, Robert. 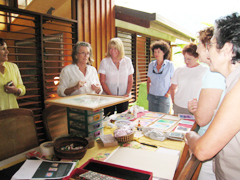 Friday - Watercolourist, Gail Shaw, demonstrates some quick techniques in her studio hideaway in the Whyanbeel Valley. Possibly visit Norrie’s pottery studio at Julatten. Dinner at Flames of the Forest for a great finale to the week! Saturday – departures and new artists retreats arrivals as above. This outline of art experiences is a suggestion only and may be altered if advance notice is given by the group. All activities are dependent upon the availability of artists and forward booking is strongly advised. Cost of your art experience inclusions? 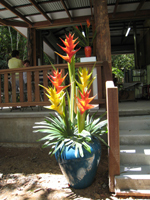 7 nights accommodation at Port Douglas Bed & Breakfast or Cahaya Puri Guest Lodge, if available. Tea, coffee, snacks and cold water will be available on all excursions. Visual diary/sketching block and sketching pencils. The inclusions above are a general guide only to activities and experiences. Any meals, beverages, transport or extra activities not listed above. Group bookings for six or more persons (maximum ten) will be accepted from the first or second Saturday of each month June - October 2018, depending on availability of all services. The bookings shall be for one week, until the following Saturday, with shorter periods being possible, dependent on availability. If these periods are unsuitable for your group, please contact us to make other arrangements. In 2018 the all-inclusive price for the seven day ARTQUEST PORT DOUGLAS experience is A$3,800 per person for groups of six or more. 50% deposit (balance 30 days prior) or full payment for the group will confirm your booking. 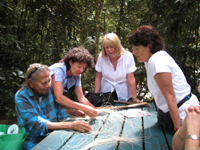 We are confident that the tropical art tour experience will exceed your expectations. A discount of $100 per person applies for those booking the seven day tour three months or more in advance. Numbers are strictly limited so PLEASE ENQUIRE NOW. Art experience inclusions will be as listed above - as well as some surprises! 1. Payments are non-refundable unless thirty days notice is given in writing. Should you wish to cancel before that period, a cancellation fee of $1500 per group will apply. 2. Minimum and maximum numbers apply to each tour. 3. 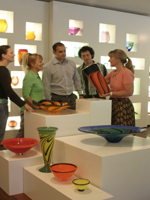 Artquest Port Douglas will do its best to ensure client satisfaction. However it reserves the right to vary schedules and art experience inclusions without notice. 4. Copyright applies to all artworks and photographs displayed as well as to the name Artquest Port Douglas and to the actual tour concept. Infringements of this law will be pursued through legal channels.